Why Use a Wine Aerator? Why Do You Need a Wine Aerator? Which Wine Aerator to Go For? Well, we can say that the wine aerator is one of the best devices invented for wine drinkers as this gadget can bring out the best in all types of wine (especially red wine). You will therefore drink tastier, more aromatic and more pleasurable wine all the time. Wine aerators possess the Bernoulli’s Principle of increasing the speed of liquid (while pouring wine) while decreasing the pressure needed for the procedure. The whole process allows air to be drawn and mixed in with the wine to make it smell and taste better. First of all, it’s important that you know how a wine aerator is supposed to work so that you can choose the best device for your needs. These days, there are lots of products out there – and obviously, some are better than others. Of course, you should choose an effective wine aerator in order for your wine to really taste better. And remember, the more stages of air filtration that a particular product has, the better final stage it will produce (which is a well-aerated wine). The design is important as you would want to be able to use it easily. If something seems too complicated for you, you can always pass up on it. Looks is equally vital because you might want to display this wine accessory on your counter or bar. This makes it easily accessible while also serving as a decorative item for wine enthusiasts. ​On the same note, storage is also a significant feature (it should be easily stored – whether you choose to display it, hide it, or bring it along with you). Also, anticipate the fact that you will need to clean the unit after using it. And so, having an easy-to-clean item should also be one of the things to look for in this type of device. And of course, the price is the final deciding factor on whether to buy a product or not. Keep in mind that a reasonably priced wine aerator is effective, functional, and durable (those things make it worth the price). Do you swirl the wine in your glass before drinking it? You do this (instinctively or consciously) because you are aerating your wine. You know this act brings out its flavor, right? And yes, it even enhances the wine’s aroma (it’s not just your imagination – it’s a proven fact). Well, you no longer need to swirl your glass of wine to enjoy it more – if you have a wine aerator, as that’s the purpose of wine aerator. The whole process of aerating or mixing air with wine is made simpler and more convenient through the use of this device. So, yes – with a wine aerator, you can just pour out your favorite wine and drink it immediately. The improved aroma will excite your senses and the taste of fruits and spices in the wine will be more distinct as well. Your desired smooth finish is now made possible in every pour and you will enjoy your wine better. A wine aerator is a very simple device. Although it comes in different models and designs, they are always easy to figure out, so to speak. There are different ways to use this gadget (depending on the model). The handheld pour-through device is one of the most common designs. 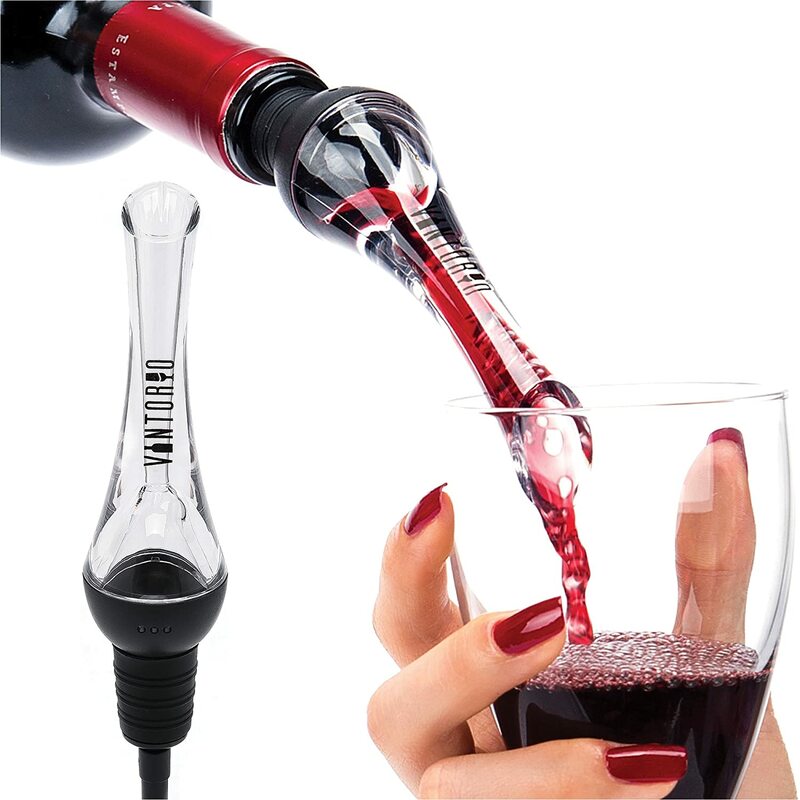 You simply need to hold this gadget with your hand (over your wine glass) while pouring the wine. There are also pour-through devices that don’t need to be held by the hand. These will work just like funnels and are placed on top of the wine glass before the wine is poured through it. Another common type of wine aerator comes in a model that attaches on the opening of a wine bottle. It will create a spout when pouring out the wine from the bottle to your glass. Perhaps, the simplest and less advanced forms of wine aerator come in the form of a whisk. This is actually effective, as whisking wine can effectively incorporate air into the liquid component. It’s as manual as it goes (for this model) and that’s why it’s the less impressive model as well (but it sure works better than manually swirling). If you can imagine beating wine the way you beat eggs, this model might appeal to you. If you always find yourself swirling the wine in your glass before drinking, you undoubtedly need a wine aerator. Using this device is very convenient and it also works quickly in aerating your wine (sometimes, you can get impatient, right?). And of course, the main reason for requiring the use of a wine aerator is that you want better-tasting wine. This device makes that possible – for both cheap and expensive wine. Yes, you will literally taste (and smell) the difference of wines poured directly into a glass and wines that are poured through a wine aerator. Check out a few of the best wine aerators that are available on the market right now. The products below are some of the favorite picks by avid wine drinkers. This model is a top rated wine aerator. As a wine aerator that works like a handheld funnel, this model comes with a rubber grip – so, it’s really easy to hold with one hand while you’re pouring the wine bottle with your other hand. It’s also very light (only about 7 ounces), so holding it won’t give you any trouble at all. Made of acrylic plastic, this is safe to use and quite durable as well. And since it’s very attractive-looking, you would want to display it on your wine counter (perhaps, with your other wine accessories). Because of its simple design, it’s very easy to clean after using it. You can either hand wash it or put it in the dishwasher. Storing this unit is trouble-free, too. It’s slim and compact, so you can choose to put it inside the cabinet if you want it out of sight. But if you choose to keep it around (for easy access and for display), you can use the stand that it comes in with. This model uses a simple aeration system that’s effective and easy to understand. You will find that your wine will taste better when using it, that’s for sure. It uses safe materials (acrylic plastic). It comes in an attractive design and can be displayed. The shape of the unit can cause an overflow of wine if you pour too quickly. Wine can continue to drip after use, so placing it on the stand will help reduce the mess. This model of aerator for the wine bottle is a device that can be attached to the opening of a wine bottle. Since you don’t need to hold it, your other hand stays free. The aeration process takes place as wine is poured into your glass. There are holes on the unit that pulls in air from the outside to mix with the wine that’s being poured. The Vintorio’s design comes with a rubber base that snuggles securely onto the opening of wine bottles (it fits all sizes of wine bottles). Because of this, you won’t need to worry about leaks and spills as you pour out your favorite wine into your glass. In fact, even the tip of the spout is ergonomically designed to pour out smoothly and easily. This unit also uses acrylic plastic, so that it’s safe to come into contact with food. The overall design is also very attractive that you’ll be proud to use it all the time. In fact, both the design and the functionality of this model are so good that it’s also an ideal gift for wine lovers. In spite of its seemingly complicated structure, this model is also a simple wine aerator device. It’s actually easy to disassemble, so you can easily and effectively clean it as well. The best way to clean the unit of wine residue is by handwashing it (under running water). Needless to say, this model is simple, effective and very convenient to use. It’s also quite cheap, that’s why it’s my favorite. This model attaches to the bottle, so your other hand is free. There are no leaks because it comes with a rubber base. It comes with an efficient spout, so smooth pouring of wine is always achieved. It needs some assembly – and when not assembled properly, there can be leaks. Sometimes the spout can get clogged with wine, so pouring at an angle is sometimes needed. 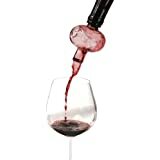 ​This model of aerator for wine is another handheld wine aerator device, but it’s quite light (at 14.9 ounces), so you won’t find it hard to hold over your glass while pouring wine. 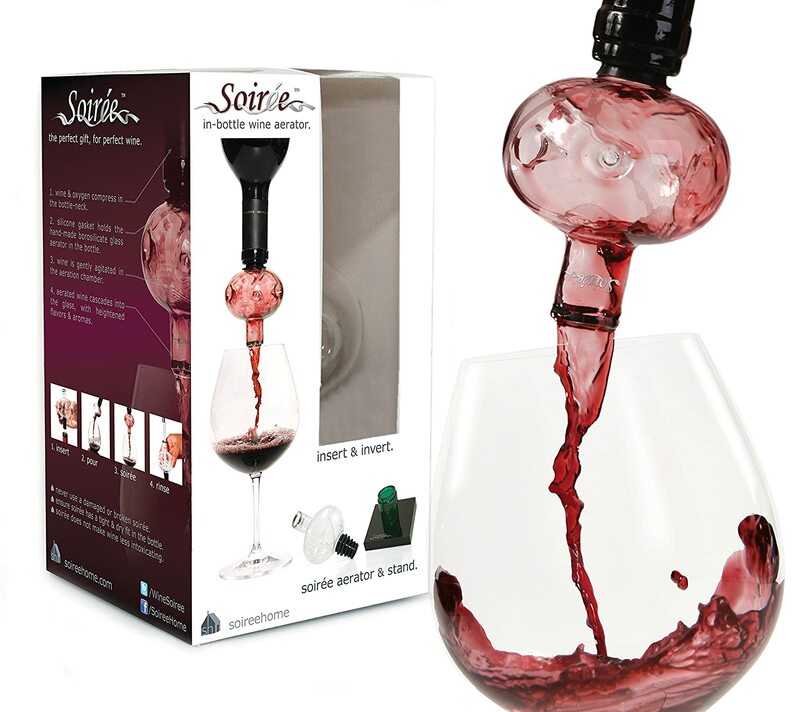 It also comes with a non-slip grip – so you can securely hold it while aerating your wine. This unit comes with 3 aeration stages for the maximum introduction of air into your wine. You can actually watch the process as it unfolds right before your eyes because the entry point already has an umbrella-like structure that starts off the whole aeration process. You see, hitting the umbrella will make wine splash over the sides of the device. The liquid will then go through many holes which will again introduce more air into the wine. And finally, the liquid will go through the final holes that lead out into your glass. In spite of seeming complicated (with 3 aeration stages), this is yet another simple unit that’s also attractive to look at. And since it comes with a stand, you can display it for your friends (and fellow wine lovers) to see. I particularly like this model because of its 3 aeration stages. Its quality and functionality make it worth every penny. It has an efficient 3-stage filtration system for the best aeration process. The design is stylish that you will be proud to display it. There can be some smell of plastic when first used. Left over wine can continue to drip and cause some mess. 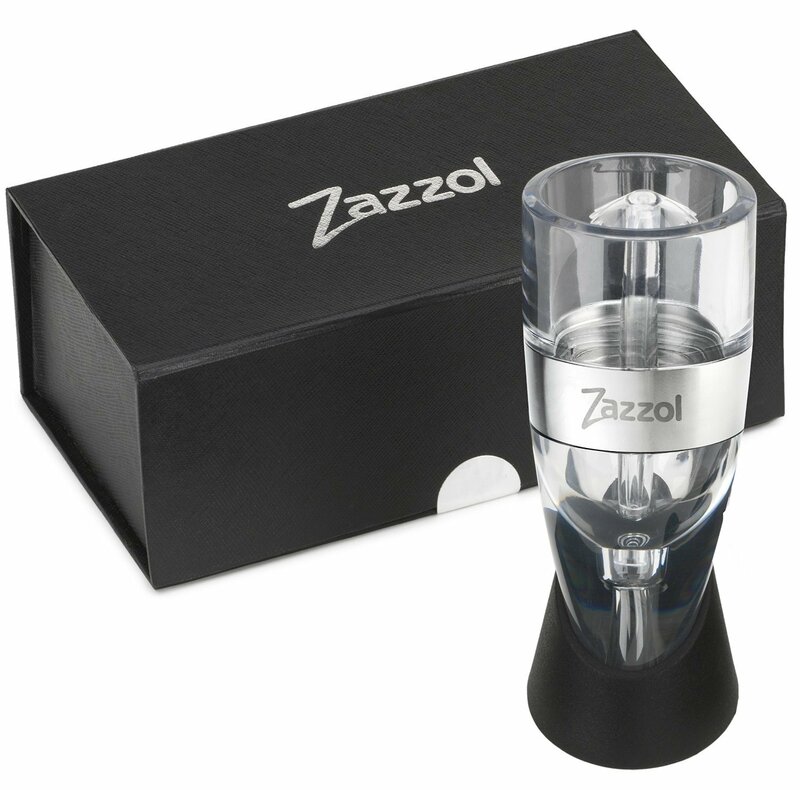 The Zazzol wine aerator is yet another handheld type of device. It only weighs around 14 ounces, so holding it while pouring wine is not that troublesome. And since it has a large opening, dripping and overflowing can also be avoided. This model comes with a 3-stage design for its aeration process. When pouring wine into the device, the liquid will first hit an umbrella-like structure that will allow the wine to splash on the sides of the unit (this stimulates air in the surroundings to add to the wine). The wine will then go through several holes before finally passing through the last passage way into your glass. It’s made of acrylic plastic, which is safe and durable. It also comes with an equally attractive stand that allows you to proudly leave the unit in plain sight (for every wine lover to see). When it comes to cleaning it, don’t worry – it’s dishwasher safe and can also be rinsed clean under running water. 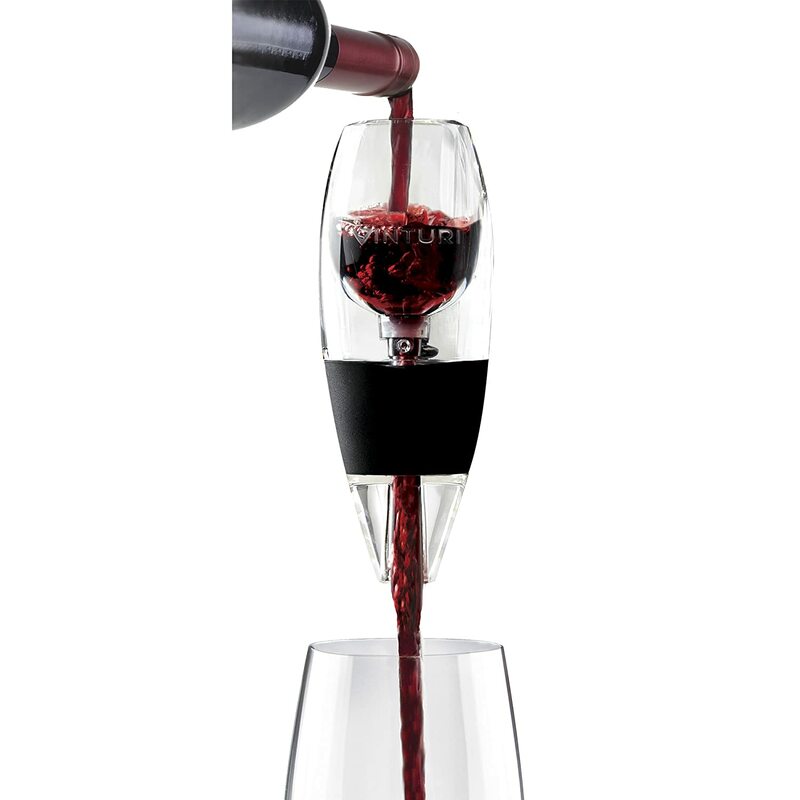 Interestingly, this model is very similar in design and features with the Vinlux wine aerator previously mentioned. They even belong in the same price range. As this product has exactly the same features as the Vinlux model, I can say that it’s just as good and impressive. However, since it’s a little cheaper than the Vinlux, it’s more affordable and economical. It comes with a large opening, overflowing is minimized. It uses 3 stages of aeration. You can easily clean it (it’s dishwasher safe). You need both hands to use this aerator. Since it comes with several parts, disassembling when cleaning can be a bit troublesome. A lot of people consider this to be the best aerator for red wine. 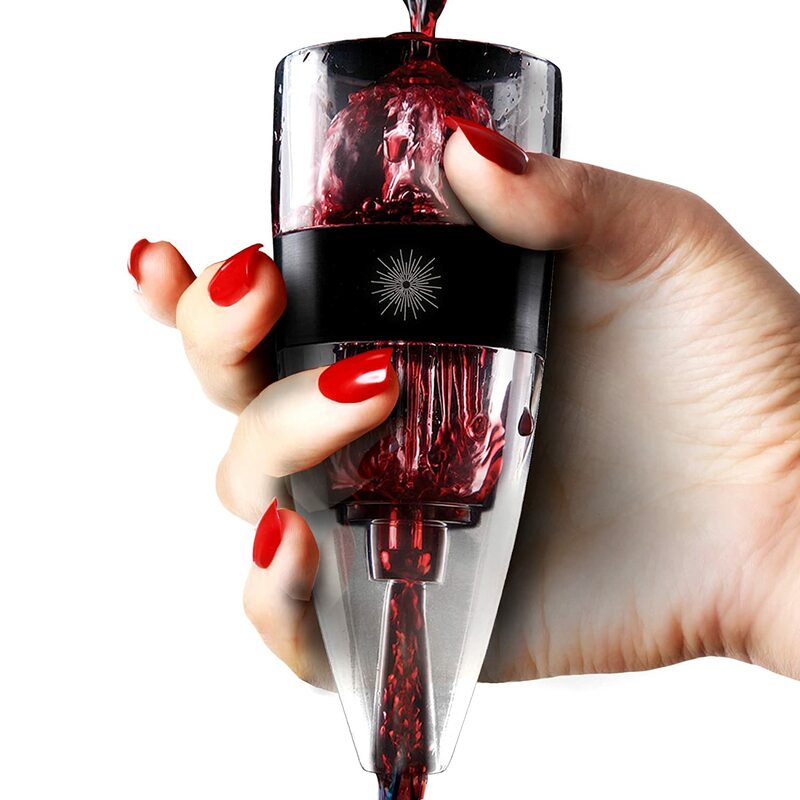 This is not a handheld model of wine aerator – it’s one of those attachable pourer types. By fitting the base onto the wine bottle opening (it fits most standard-sized wine bottles, by the way), the liquid will pass through an air-filled chamber before completing the process of wine aeration. In spite of being made of glass, this unit is light and weighs only about 6.4 ounces. You can therefore easily handle and secure its attachment to the wine bottle. This model also comes with a stand that also serves as a drying rack. Perhaps, its only obvious fault is that its design doesn’t make it very easy to clean. It only comes in 1 piece, you see, so you really don’t have a lot of options in cleaning the inside part (especially when wine stains are stubborn). And of course, you need to be very careful when handling this unit because glass can easily break. Although g﻿﻿lass is one of the safest materials for accessories that touch food, it also requires more care. This is a cute and functional wine aerator that’s reasonably priced as well. It’s convenient to use since it attaches to the bottle. It’s safe to come into contact with food since it’s made of glass materials. Since it’s light, it won’t add much weight to the wine bottle. Its one-piece design makes it difficult to clean. It’s quite fragile since it’s made of glass. You really can’t go wrong with any of the models of wine aerator mentioned above as they can all make your wine taste better. Not only are they effective, they are all attractively designed as well (you will be proud to display them all). If you prefer having at least of your hands-free, you will probably appreciate the model that attaches itself onto the wine bottle. This way, aeration can take place as you pour the wine into your glass. The Vintorio wine aerator makes for a great buy since it’s very affordable and functional as well. If you prefer to hold the wine aerator as you pour wine into your glass, you can go for any of the Vinturi, Vinlux, or Zazzol models. The Vinturi, however, only has 1 stage of aeration while the Vinlux and Zazzol models come with 3 stages. And so, if you are particular with this feature, choosing between Vinlux and Zazzol will probably work better for you. While the Soiree model is also good, keep in mind that it’s made of glass and is therefore more delicate than the other models (which are all made of high-quality acrylic plastic). Also, of all the models of wine aerators mentioned above, this model is the hardest to clean. All in all, you can take your pick from the above products and choose the best aerator for a wine that suits your needs. It’s about time that you stop swirling your wine to manually aerate it, right?